Improve reading comprehension by building confidence and inspiring achievement with these fun reading passages. 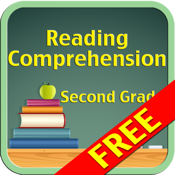 Second Grade Reading Comprehension (free version) contains 3 stories that demonstrate the effectiveness of this app. Each story is followed by questions that measure achievement quickly and easily. Reading confidence will grow with each new story. The full version of the app features all 40 high-interest stories for second grade. Delightful illustrations grab children’s attention and encourage children to read and explore on their own. All of our apps are written by certified reading teachers and designed to develop and reinforce reading comprehension skills. Reading Grade 2 has been professionally leveled by reading experts to ensure that the language and vocabulary are age-appropriate. • 40 age-appropriate reading passages that appeal to young readers, illustrated with photos. • 160 multiple-choice questions that strengthen and build standardized test-taking skills. • high-interest stories that are easy to relate to and make reading more relevant. • engaging stories that encourage students to read actively and explore reading on their own. • questions that cover all aspects of reading comprehension. • Our unique double-check scoring system! In addition to a cumulative score at the end of each section, individual scores are calculated for each story. This immediate feedback keeps students on track for success.